Camp Richardson Resort is a historic resort located in South Lake Tahoe California, with full service marina, lodging and cross country skiing. The full service marina is a summer hot spot for boat enthusiasts. 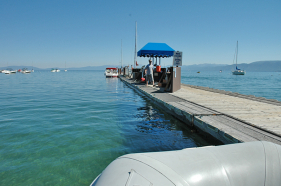 Camp Richardson Marina boat ramp gives you quick access to Lake Tahoe, but get their early to get a parking spot. If you pay for mooring it includes shuttle service out to your boat and fueling from their deck. The marina offers a large selection of summer water rentals such as kayaks, canoes, jet skis and boat rentals. Enjoy all that Camp Richardson Resort has to offer beyond the marina – swim beach area, lakefront Beacon Bar and Grill, lodging, camping sites, cabins, bike rentals and more.